What do Off Track Betting, the World Trade Center and some of New York City's most troubled schools have in common? All are run by a government agency, but won't be for long. They are being "privatized" -- taken over by companies that hope to run them as businesses and make a profit. These institutions join the many enterprises that New Yorkers considered to be locked firmly in the public sector but that no longer are. For example, services for the homeless and management of parks, to varying degrees, have been turned over to businesses or nonprofit organizations. Not everybody approves of this across-the-board trend (See story by Bronx Borough President Fernando Ferrer) And not all the efforts have been successful. The courts blocked sales of the city's water system and of Coney Island Hospital. Although Giuliani has said he would like to get the city out of the hospital business, the Health and Hospitals Corp. still operates 20 hospitals. Just last week, the administration's plan to have private companies find jobs for welfare recipients foundered badly, as the companies accused the city of mismanaging the hand-over. But the trend does not seem to have played itself out. The city is taking steps to lease its airports to a corporation, and at least one critic argues that New York's School Construction Authority should be replaced by private contractors. Meanwhile, in some other jurisdictions, private companies run the prisons. Whatever the targets may be, the arguments for privatizing them are much the same. Proponents say a business can provide better services more efficiently. Opponents, such as public employee unions, prefer to keep matters in the government's hands, fearing a corporation could cut the civil servants' wages and benefits. Other critics maintain that many operations simply cannot be run at a profit without sacrificing quality, stinting on service or ignoring the neediest New Yorkers. The debate over the proper role and size of government has gone on for centuries. Indeed some existing public enterprises were originally run by businesses and then made public. The New York City subways were operated by private companies until mounting financial problems forced them to sell out to the city in 1940. The idea of cutting back on government and expanding the role of the private sector began picking up speed about 30 years ago when it was championed by management professor Peter R. Drucker, who coined the word "reprivatize." Theory turned into practice when Margaret Thatcher become prime minister of Great Britain and promptly began selling off state-owned companies, such as British Petroleum and Rolls Royce. Since there weren't any such state-owned companies in the United States, one focus of privatization in this country has been local governments. With its wide array of public services, including housing, health care, transportation and media, New York was a particularly tempting laboratory, and since his election in 1993, Mayor Giuliani has been eager to experiment. The mayor has been spurred by several goals. In some cases, he says the public sector has failed and the private sector could do the job better. So he has sought to break the Board of Education's grip on the city schools, which he often criticizes. He has not, though, offered to lease out the Police Department, which he credits with the drop in crime, to private security firms. Giuliani has focused also on publicly owned enterprises whose sale can produce a big infusion of cash. For example, the sale of WNYC-TV in 1996 brought in $207 million to the city's treasury. Then, too, as New York's first Republican mayor in 40 years, Giuliani has sought to shake up a public establishment that has been linked to the Democrats. But some Democrats have supported privatization as well. For example, former Governor Mario Cuomo has been quoted as saying, "It is not government's obligation to provide services, but to see that they're provided." Privatization can take a number of forms. Some citizens simply opt out of public services. "The problems that have made life tough for all New Yorkers have led lawyers, bankers and other high-income families to deal with the decline in public services by privatizing on their own," write Charles Brecher and Sheila Spiezio. "Their children go to private schools. . . . They have private security in their buildings - and even in their neighborhoods. They rely on black car or limousine service for transportation. They depend on private health insurance and private hospitals. For those who can afford it, the private purchase of formerly public services has become routine." 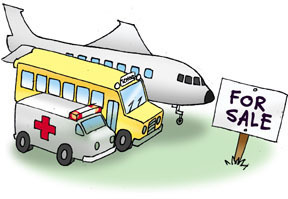 Governments can transfer responsibility for delivering a service by contracting with a private agency, issuing vouchers to recipients of what had been a state service or leasing a publicly owned facility to a private operator. And a government agency may remain public but set out to mimic some of the practices of the private sector. It is thought that the New York City Board of Education was trying to do precisely that when it appointed former Citicorp lawyer Harold Levy schools chancellor. HOW "EFFICIENT" WAS "CRYSTAL PEPSI"? But the arguments go beyond efficiency. There are, of course, those who make money by taking over public services or facilities. Others, Savas has written, seek privatization because they believe in less government, while some are hoping to take power away from a faceless bureaucracy and transfer it to people who will now be able to choose among various providers of a service. Adherents of a free market argue that, if public enterprises have to compete, whether with private enterprises or other public ones, they will be forced to improve services or face extinction. But where some see efficiency and improved service, others see danger. After all, the private sector does not always do things right, Diane B. Enriques noted in the New York Times, as she faulted privatization advocates for ignoring "every modern example of private-sector incompetence from New Coke to 'Ishtar.'" If she were more up-to-date, she might have thrown in Crystal Pepsi, Firestone tires, "Waterworld," or anything else Kevin Costner has appeared in lately. In his book, "You Don't Always Get What You Pay For: The Economics of Privatization," Elliott Sclar, director of urban planning programs at the Columbia University School of Architecture, argues that taking responsibilities away from government does not always produce cost savings and great efficiency. But he is most concerned about the erosion in important public values - even over something as simple as a parking garage. After Westchester had a private business operate the garage at its county medical center, fees went up until poor patients could no longer afford to park there. As more and more services become private, critics worry that only society's least powerful will rely on public offerings and that therefore the quality of those services will spiral inexorably downward. And Savas concedes, "preoccupation with efficiency, competition and market forces may overlook interests and issues vital to social well-being." Perhaps the biggest difficulty with privatization, as with so many other ideas of the moment, is that some view it as a panacea. In a paper prepared for the Urban Institute, Demetra Smith Nightingale and Nancy Pindus conclude there is little "clear evidence that private sector delivery [of services] is inherently more effective or less effective than public service delivery. . . . There are examples of success and failure in both sectors." What seems most important, they continue, "is whether the service is made accountable for its actions and whether public objectives are clear." While castigating the public Board of Education for failing to teach the city's children, Giuliani has advocated both charter schools and vouchers. The former are privately operated and run more or less independently of city or Board of Education regulation, but receive money from the government. While these schools can be run by groups of parents or teachers as well as small community groups, the charter school process in New York has tended to favor large nonprofit groups and for-profit educational management companies. According to a report in City Limits, fully half of the 23 charter schools that the state approved to open in 2000 or 2001 -- including two in New York City -- will be run by for-profit companies. The charter movement in the city - and the for-profit companies -- got a boost earlier this year when Chancellor Levy announced he would turn some of New York most troubled schools into charter schools. Although some non-profit agencies applied for charters, the Board of Education has narrowed the list of candidates down to four for-profit companies: Edison, Mosaica Education, Victory Schools and Advantage Schools. Such companies are emerging as a big trend in education, Janelle Scott, of the National Center for the Study of Privatization in Education at Columbia, has said. They maintain that by introducing better management techniques and by not being forced to hire union workers, including teachers, they can both provide a quality education and make a profit. The jury is still out, though. Although some studies say charter schools do help students, particularly in inner cities that are often poorly served by the public schools, other studies are less favorable. And so far, according to Businessweek, few of the for-profit school companies made a profit. Gail Foster, the founder of the Toussaint Institute, says she became interested in privatized or charter schools because they could allow for more community involvement and control. But, she says, in New York "the word is going around the African American community that you have to have a management company to do a charter school. . . . Have we just substituted the public bureaucracy with a Wall Street bureaucracy?" Under the voucher system, parents would receive the equivalent of a few thousand dollars a year that they would have to use to "purchase" their child's education - at a public, private or, in some cases, even a parochial school. The dispute over whether to launch a pilot voucher program in New York helped speed former, Schools Chancellor Rudy Crew's departure from the city. Even though Crew is gone, though, there is no voucher program in New York. To candidate Rudy Giuliani in 1993, Off Track Betting exemplified the inefficient public enterprise. It was, he said, "the only bookie operation in the world to lose money," and he pledged to clean it up and sell it. In the last fiscal year, OTB made a profit of $39.2 million. It is now up for sale, and bids could go as high as $400 million. Given that wagering on horses is not exactly an essential social service, there's been little opposition to the proposed sale, other than from District Council 37, the union that represents OTB workers. Similarly, the leasing of the World Trade Center by the Port Authority of New York and New Jersey has attracted little opposition, with some of New York's top real estate companies bidding for a 99-year deal. The agency could realize $2 billion from the arrangement. The Port Authority, though, is more reluctant to surrender control of LaGuardia and Kennedy airports -- an idea the mayor has enthusiastically advanced. "We're losing passengers, we're losing business, and we're losing prestige because of the Port Authority's management," the mayor has said. Even though the authority's lease on the airports is not set to expire for another 15 years, Giuliani has requested bids from private companies interested in running the facilities. City officials hope this move will encourage the Port Authority, which they say has cheated New York City out of millions in revenue, to step out before 2015. Perhaps no public service seems as inherently public as a park. Yet private groups and businesses are playing an increasing role in the city's parks. Between 1987 and 1996, city spending for parks fell 31 percent, but the amount of private money for it increased threefold. This administration has turned much of the responsibility for maintaining and improving the parks over to public agencies, such as the Central Park Conservancy and the Prospect Park Alliance. Some facilities, such as Central Park and Bryant Park, have thrived under this arrangement. But most people tend to support parks only in their own neighborhoods. So playgrounds and other recreational facilities in poorer areas, particularly in the Bronx and Queen, have suffered. Then there are the 503 private "parks" that are supposed to be public. They were created under a 1961 regulation that allowed developers to build additional floor space in exchange for furnishing plazas, arcades, walkways and atriums for the general populace. A recent study of all these spaces found that only 15 are so appealing that they draw visitors from across the city, while 66 "neighborhood spaces" attract people from within the community. But 207 "marginal spaces," are so bad that people try to keep away from them. According to the Municipal Art Society, "many building owners have let their plazas fall into neglect, depriving the people of New York City of active public spaces." Part of the national drive to change welfare as we know it has involved contracting out an array of services intended to help the poor. Perhaps most notably, the city Department of Human Resources, rather than operating an employment program, was to contract with private companies who would place welfare recipients in jobs. Last week, though, the administration began backing away from the plan, with the companies charging that the welfare recipients had not been screened for drug or mental problems. "It's been an operational nightmare," one contractor told The New York Times, adding that the city "could not have done a worse job if they tried." Privatization of some other social services, however, is in place. By 1997, private agencies already took care of 70 percent of New York's foster children. The Department of Homeless Services has shifted away from directly operating shelters and other facilities and has been contracting out those services. According to a study by Gordon J.Campbell and Elizabeth McCarthy that appeared in the Policy Studies Journal earlier this year, more than 100 shelters, eight drop-in centers and six outreach teams are run by private nonprofit agencies. The writers believe this has enabled the city to provide the homeless with better services at a lower costs. As long as there is a New York City government, it will no doubt be doing things that some critics think could be better done by the private sector. Prisons, which in some places are operated by for-profit businesses, are still in New York's public sector. Some of the many critics of the city's School Construction Authority have proposed that the way to build more classrooms - and to build them safely and promptly - is to turn the job over private contractors. And, then of course, there are the subways. Is it time to sell them back to private operators?